Safe Harbor is a small environmental consulting group working on Cape Cod. 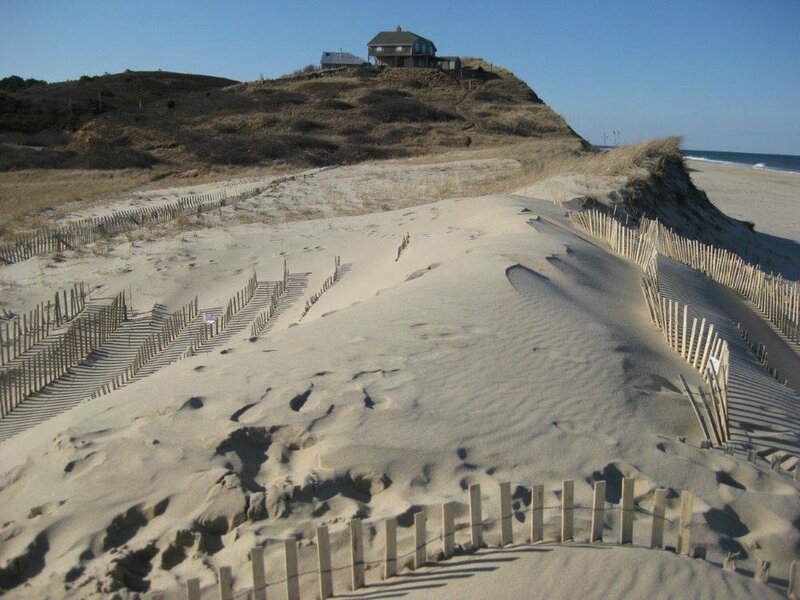 We are front and center on the land-sea boundary where Climate Change events are already being experienced: Sea Level Rise; More Powerful Storms; and Sudden Sea Level Rise, where protective Barrier Beach and Dune systems have been breached. Safe Harbor studies our Coastal Resource areas as "Linked Systems": Near Shore Sand Bars; Eel Grass Beds; Fringe Marshes; Beaches; and Dunes. We believe these Resource Systems respond to Storm Energy Pulses, not individually but as systems. This onshore alignment of natural energy interacting with nature based, green infrastructure, creates an intuitive model for studying Coastal Resiliency. Linked resource systems modify transmission of pulse energy. These changes in Pulse Energy provide clues to how we might use "Available Storm Energy" as a tool to modify coastal geomass. We have successfully explored some innovative strategies, using higher "Pule Energy" to enhance resiliency in a few linked, coastal resource systems. We have multiple projects currently underway. Cape Cod has become a Climate Change Interface, extending into changing seas and experiencing amplified tidal surges from a new generation of Mega Nor'easters. When studying these Climate Change "Pulse" events, we should keep in mind that our sand bars; fringe marshes; beaches and banks, may be responding to Storm Energy as "Linked Resource Systems". Some considerations for evaluating Climate Change events are shown in the lateral image below. Climate Change and the Outer Cape: Understanding changes in sea level, temperature, precipitation, habitat and storm events. Global temperatures may be approaching a million year high, C O2 levels have been measured at an exceptional rate of increase. What should we expect? How do we begin to understand changes we're already witnessing in weather patterns and invasive species of marine and terrestrial plants, birds and animals? Why are scientists telling us we have to accept "uncertainty" when we ask for explainations? Some answers are actually coming from outer space. New satellite technology enables us to finally glimpse the planet we live on as a closed system: a responsive, pragmatic, organic entity. Teleconnections are the "Ringmasters" of our climate change events. Hemispheric, coupled, ocean atmospheric systems are in control of our jet stream. We take advantage of new generation, exceptional satellite imagery being used to track changes in world climate. Subtle changes and differences, over tremendous areas, represent changes in the Earth's powerful thermal delivery systems. These patterns are tracked and referred to as "Trends".Scientists studying atmospheric anomalies often find correlations with other anomalies. These possible linkages, or atmospheric bridges, are referred to as teleconnections. This radar satellite image, uses color to represent subtle differences in ocean height, which can be correlated to ocean currents. For more information please visit our OCEAN CURRENTS page. Perhaps the most critical portion of the world's ocean circulation exists near Greenland, where warm surface currents are super cooled, transferring heat to Western Europe. This cold water forms a bottom current which begins a two and a half year journey that ends in the central Pacific. Excessive melt water from warming Greenland glaciers has interfered with this process by reducing salinity. The above image reflects the astounding rate of glacial melting in Greenland. The "freshening" of this zone of the North Atlantic Ocean has been correlated to changes in THC. If the THC was reduced by glacial melt, less heat would be transported north. Uncertainty is a significant issue in climate change scenarios. We will be challenged to make room for uncertainty in our thought process, teachings and recommendations to policy makers. To continue reading please visit the full article, The Role of Uncertainty.